See, Hear, Touch, Smell, Kids use their senses in nature! FUN scavenger hunt game for kids 3-6. Great for grandparents, camps, parents! 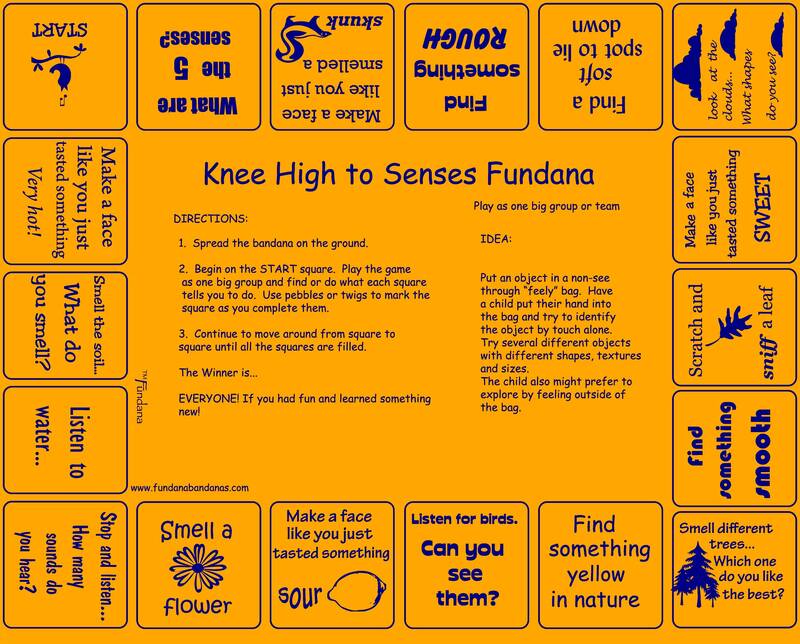 The Knee High to Senses Fundana is a scavenger hunt game designed to teach kids 3-6 years old about nature using their senses in a fun different way. Some of the activities on the bandana are: "Stop and smell a flower", "Listen for birds can you see them?" and more! Included on the Fundana is a fun enrichment activity- Creating a feely bag for your kids to try and discover different sizes, texture objects by feel. An activity that can be played again and again making new discoveries everytime! It's a unique, easy way for parents, grandparents, early childhood programs, camps to introduce young children to nature. The Knee High to Senses are printed on a soft, orange made in USA 100% cotton bandana. We do offer a special price to teachers and Scouts. Please e-mail us sales [!at] fundanabandanas.com to get our special pricing. We also do custom work. If you would like to create your own Fundana or need a custom bandana we can do it. There is a minimum. Please e-mail us for more information.